We have partnered with several small producers who have the same fastidiousness for quality poultry as we do. They raise pasture fed, free ranging birds in small batches that produce healthy, flavorful meat and eggs to the same standards that we do at Reality Farm. 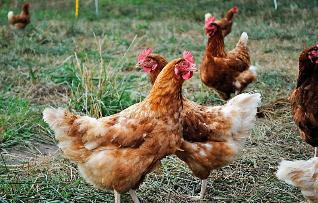 Our chickens, enjoy the full benefit of eating greens and insects. They are born and live in natural pastures, free from the disease and infections prevalent in animals subjected to mass confinement. They transfer these health benefits to their eggs, which are also high in folic acid. Free-range broiler chickens and turkeys are leaner and more flavorful than commercially-produced birds. They are available seasonally, but please call/email us for availability. Whole chickens priced per pound. Eggs priced per dozen.